The last two weeks have been amazing in their lessons for me. Last week, my silent directed retreat to Little Portion left me rested and better prepared for the journey ahead and while there I learned so much about my relationship with God and my need for rest. This week, I have just returned from the Jumping Tandem Retreat in Ashland, Nebraska and what an amazing experience! I have learned more about living my God-sized dream, what that means and what it is. Over the next few weeks, I’ll be sharing reflections from both these experiences. Here is the first, an introduction to Jumping Tandem. After they had been in custody for some time, each of the two men—the cupbearer and the baker of the king of Egypt, who were being held in prison—had a dream the same night, and each dream had a meaning of its own. There were a hundred of us gathered in a small chapel room at the Carol Joy Holling Conference Retreat Center in Ashland, Nebraska. We came for different reasons and at different stages in our journey. Each of us fancied ourselves writers or artists of a sort, but all of us were dreamers…and that’s really what we came for…to learn about God-sized dreams and spend time fleshing out our own. My sweet friend and heart sister, Holley Gerth, kicked off the weekend with a challenge- put your dream on paper…and then tell someone about it. She asked us to lay down the sword of criticism and pick up the Sword of Truth, and turn to a heart sister we hadn’t met yet, pull up our ribs and show off our beautiful, captivating, Jesus-imprinted hearts. The room erupted in the fervent sharing of each other’s dreams and smiles and encouragement floated in the air, divine appointments were met and I had the intense sensation that this weekend would be one of openness and vulnerability, of encouragement and deep thinking, and that somewhere in that room was a heart that would help me interpret my dream. Dreams are funny things, you know? They have life and breath and emotions. They teach us about ourselves and our world and how we view it. They make us yearn for something more and reach beyond our lives and experiences to a bigger understanding of the mystery that is this existence. But, if not carefully interpreted and shared, they can invite doubt and fear and anxiety and comparison to set up camp in our lives and breed together to birth resentment and bitterness. I know that the passage above from Genesis is addressing specifically prophetic dreams, but I think there is something more in it for the dreamers of the world. Don’t we feel that? When we have dreams and no one to help us make sense of them? No one to hold us accountable to them. No one to go along with us on the experience? Tandem, by definition, is the arrangement of two or more persons, or objects, behind each other. So in essence, tandem skydiving is arrangement of two skydivers, the student and the instructor, where the instructor’s harness attaches them to each other. 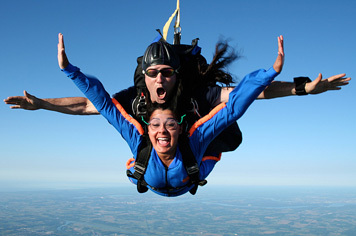 During a tandem jump the student sits in the front of the harness and both the student and the instructor share the instructor’s parachute. Jumping Tandem Retreat was about not going it alone. Was about having another heart hear and interpret your dream and about making the leap together using the same big God-sized parachute. Our “skydiving” instructors this weekend shared with us their own God-sized dreams and how God was making them happen (most often in unexpected and sometimes uncomfortable ways), they shared with us their own fears and they shared with us how they learned to jump anyway, and then they helped us suit up to take the leap. I have never experienced anything quite like it…and I can’t wait to go back next year and hear the stories that are being written on the hearts of those who attended this year.